Stereolithography (SLA) is the oldest of all 3D printing technologies, its emergence marking the start of the 3D printing revolution. Today, the 3D printing market offers a wide choice of SLA 3D systems, ranging from desktop 3D printers to larger AM systems for industrial applications. With this in mind, we’ve chosen to cover a selection of the top professional SLA 3D printers on the market so far. These include both desktop and industrial-grade SLA systems. But first, how does SLA work? Since it first emerged in the late 1980s, SLA technology has evolved into a cost-effective tool for producing parts with high dimensional accuracy and a smooth surface finish. It also offers great material flexibility, with a wide variety of plastic materials available to print with. The SLA printing process uses vat photopolymerisation technology. During the production process, a vat of a liquid photocurable resin is selectively cured by a UV laser layer by layer, causing the resin to solidify. Once the printing is complete, the object can then be removed from the build plate, supports removed and the part additionally cured in a UV oven to ensure that it has completely solidified. SLA technology can be used with both desktop 3D printers and high-end industrial machines. Making the choice between both options, however, is not only a matter of cost. Industrial SLA 3D printers tend to have a wider choice of materials and produce more accurate parts than desktop 3D printers, for example. Industrial AM systems are also designed for repeatability but will, on the other hand, require a skilled operator. Alternatively, desktop 3D printers do offer ease of use, although post-processing times will be longer. Here is our selection of the top 10 SLA 3D printers on the market right now. Developed by Hong Kong manufacturer, Nyomo, the Minny 3D printer has been described as “the smallest professional 3D printer in the world”. This compact 3D printer uses Digital Light Processing (DLP) technology, a sister technology for SLA, and can create dental products, jewellery and hearing aids. The Minny is a user-friendly machine, capable of high printing speeds. It is also compatible with a range of resins in different colours, from standard to castable. Materials: standard (translucent orange, white, blue, gray) resin, castable, and dental (stone and castable). The Pico 2 is a professional desktop 3D printer from Australian manufacturer Asiga. Asiga’s patented Slide-And-Separate (SAS) technology makes the Pico 2 a highly precise machine with 1 micron resolution in the Z-axis, and a reduced need for supports. The Pico 2 system has a diverse material choice for specific applications, including biocompatible dental materials. The machine also features the Squeeze Build Tray, allowing for fast materials replacements. This compact-size machine is designed for 3D printing smaller items within the medical and jewellery industries. Taiwan-based XYZprinting is a specialist in low-cost FDM printers, and has now branched out into SLA 3D printers. Its Nobel 1.0 A printer is a user-friendly system that should be quite attractive to designers, engineers and architects looking for high quality and affordability. The machine features a 128 x 128 x 200 mm build volume and an automated mechanism for refilling a resin vat. 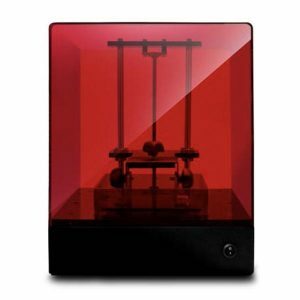 This SLA 3D printer uses standard resins in various colours, as well as castable, flexible, tough, and rigid resins. One of the pioneers in bringing SLA to the desktop world, Formlabs has recently released its Form 2 plug&play SLA system. The machine offers notable features like an automated resin refilling system, WiFi connectivity and auto-generated supports. However, the consumables for the Form 2 are expensive and the automatically generated supports may be dense and difficult to remove. This SLA 3D printer is compatible with a wide assortment of resins, including standard (clear and white), castable, flexible, dental, and tough. The Form 2 is an option to consider for jewellery designers, prototyping engineers and dental labs. Materials: standard resin (clear and white), castable, flexible, dental, and tough. 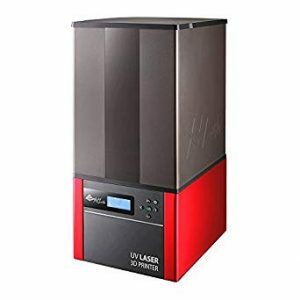 The Liquid Crystal is one of the most affordable SLA 3D printers on this list, and is manufactured by UK-based company Photocentric. Based its patented Daylight Polymer Printing (DPP) technology, the system uses an LCD screen instead of a laser or a projector to solidify resin. This means that it requires less power. For its price tag, the Liquid Crystal offers a decent level of precision and features an intuitive user interface. However, some difficulties were have been reported with part adhesion and repeatability of the process (source). A range of proprietary resins is available, including castable, firm, and model. 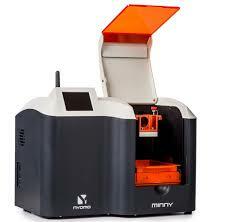 US manufacturer Nexa3D introduced the NXV 3D printer earlier this year. This system relies on proprietary Lubricant Sublayer Photo-curing (LSPc) technology which enables the printer to reach a printing speed of up to 1 cm/min). Nexa3D positions the NXV as a professional 3D printer suitable for functional prototyping, production of tooling and also end-use parts. Materials: Digital plastics, castable resins, biocompatible dental, automotive urethanes. First introduced at formnext 2017, the ANTARES 3D printer is developed by Italian manufacturer Sharebot. This industrial SLA system offers a generous build volume of 250 x 250 x 250 mm and remote printing management. However, the material choice is currently limited to two materials: black and stronger grey resins. Applications of the printer include rapid prototyping, as well as R&D modelling within various industries. DWS, another Italian 3D printer manufacturer has developed its industrial-grade XPRO S system with a large print capacity in mind. Featuring a 300 x 300 x 300 mm build volume, the machine is targeted toward industrial prototyping in medium and large companies. 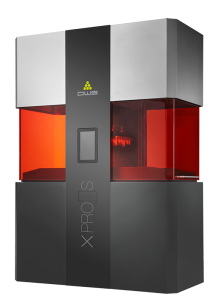 The XPRO S is compatible with a wide range of DWS proprietary resins suitable for investment casting, moulding, functional prototypes and also nano-ceramic resins for 3D printing of end parts. 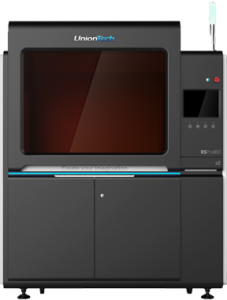 China-based SLA specialist UnionTech is notable for its production of industrial 3D printers with large printing volumes. The RSPro 800, the latest system in the line, offers a generous build volume of 800 x 800 x 550 mm and capable of building large accurate parts up to 100 cm long. The machine also features a closed-loop system which automatically regulates laser power, printing temperature and resin consumption. The ProX 950 is the largest SLA 3D printer available on the market, developed by US-based 3D printing giant 3D Systems. The machine is capable of producing detail-rich parts up to 150 cm long. In addition to its large printing capacity, the machine uses a wide range of photocurable materials, from polypropylene-like and ABS-like resins to composite and castable resins. The ProX 950 also features exchangeable material modules for faster material swapping. The ProX 950 applications vary from casting patterns, medical models to end-use parts.